Lama Zopa Rinpoche receives a long life puja in Hong Kong, 2010. New Booklet from Rinpoche Coming Your Way! “One of the incredible benefits of FPMT centers is that they offer education. They offer a place to practice and receive teachings on Buddha’s sutra and tantra teachings, on how to live life and how to overcome death. Mainly, the centers offer sutra teachings and philosophy which explain how we can be free from death and also how to not be afraid of death: to take refuge in the Buddha, Dharma and Sangha, and how to do the special practice of integrating the entire teachings of Buddha into the five powers. This is a daily practice and also a special practice at the time of death which makes death most beneficial for sentient beings, for the numberless hell beings, hungry ghosts, animals, human beings, suras, asuras and intermediate state beings. Use the five powers near the time of death to have the happiest death and make it most meaningful. The centers offer education on the Buddha’s teachings, for example, the very basic teachings such as karma – action and result. From pure action, the result is happiness and from negative action, the result is suffering. These teachings are important and fundamental to be able to help oneself and others. These teachings are even fundamental for this life’s happiness and success. By knowing how to abandon negative karma and how to create good karma, this can create the cause to achieve happiness in all future lives, good rebirth, happy rebirth, including being reborn in a buddha’s pure land. Then one is free from the hell, hungry ghost and animal realms. If one is born in a pure land, one can become enlightened there. Knowing these fundamental teachings can cause happiness in one’s future lives, and not just one life, or two lives or three lives, but hundreds and thousands and millions, billions, zillions and trillions of lives until you are free forever from samsara, free from continuously taking rebirth, the aggregates taking birth. These aggregates come from the contaminated seed of delusion and are caused by karma and delusion. This is what continues in samsara. It is not until you stop this completely that there is no more death and no more rebirth, no more oceans of samsaric suffering. Then one can achieve ultimate happiness forever, the blissful state of peace. For this one needs to understand the true path taught by Shakyamuni Buddha. [One needs] to learn and practice to be able achieve ultimate happiness, total liberation from the oceans of samsaric suffering and its causes, and not only that, even more importantly, to be able to cause all sentient beings to achieve the peerless happiness, full enlightenment. [One needs] to achieve the complete cessation of gross and subtle defilements and the complete qualities of all the realizations. For that one needs to actualize the Mahayana path – the five paths and ten bhumis – according to sutra and to achieve enlightenment by practicing the paramita path of sutra. For that one needs to collect the merit of wisdom, which is the cause of the dharmakaya, for three countless great eons. For that one needs to collect the merit of virtue for three countless great eons, which is an unbelievable amount of time. This means that the sentient beings who depend on you in order to be free from suffering and to become enlightened have to suffer for an unbelievably long period of time, eons. This is unbearable, so Buddha revealed tantra, the quick way for sentient beings to be liberated from the oceans of samsaric suffering and to achieve full enlightenment in one brief lifetime. Tantra has four levels and the fourth level of tantra is the maha-anuttara path. This is the quickest path to achieve full enlightenment. The first level of tantra, kriya tantra, enables one to achieve enlightenment in one lifetime, so that is unbelievably quicker than the paramita path of sutra. Practicing the fourth level of tantra, the maha-anuttara path, has the greatest skill because one can achieve full enlightenment in a brief lifetime during degenerate times – this means much faster than by practicing lower tantra. The idea for the FPMT centers is that they offer education in all these paths: sutra and tantra. The centers offer education in all the paths, even highest tantra, giving everyone the opportunity to achieve enlightenment in one brief lifetime during degenerate times. “Rinpoche jumped up from his chair suddenly and ran to the center of the restaurant, went on to his knees and quickly tried to protect the cockroach from the waiter about to severely damage it with his foot! The cockroach got away and we were all after it. It ran under Rinpoche’s foot and Rinpoche stood still keeping it under his foot, protecting it and reciting mantras. While this was happening, we explained to the six or seven waiters that we were just trying to protect the cockroach and bless it. 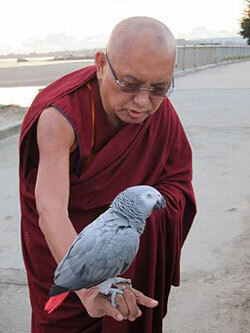 While going to bless the ocean in Aptos, California, Rinpoche passed a man with a parrot on his shoulder and started blessing the bird by reciting mantras, March 2011. We are in Bangalore about to go to the airport again after a day with the Indian bureaucracy. It is a long complicated process dealing with the foreign registration office but we had lots of help and at the end Rinpoche was asked if he would go behind the counter and bless all the staff. Rinpoche happily accepted and blessed the staff one by one. That takes time! FPMT International Office is delighted to share with you our FPMT Annual Review 2010: Expanding Service, Strengthening the Tradition. It is available for you to read in two formats: as a PDF or as a dynamic, page-turning eZine. We hope you enjoy reading it as much as we enjoyed reviewing 2010! 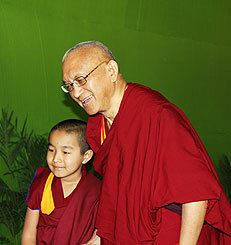 We have added a fantastic selection of photos of Rinpoche taken during 2010 and 2011. 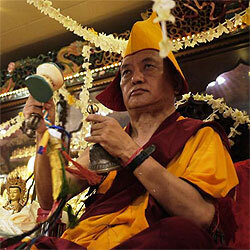 To view, please visit Rinpoche’s Photo Gallery. Lama Zopa Rinpoche at a puja a day before Losar at Kachoe Dechen Ling, USA, March 2011. We are delighted to share with you that as part of our process of updating FPMT teacher policy and process, we have been able to offer 72 honorary certificates to 58 currently-registered teachers! (Some are receiving certificates for more than one FPMT standard education program.) And there will be more to come …. Living in the Path‘s module 6, Happiness of Dharma, is coming very soon! Lama Tsongkhapa Guru Yoga, a commentary by Lama Zopa Rinpoche given at Amitabha Buddhist Centre, Singapore in 2011, is now available in audio and video formats. Lama Chöpa, a commentary by Lama Zopa Rinpoche from Potowa Center, Indonesia in 2010, is now available in audio and video formats. Restrictions apply. His Holiness Dalai Lama’s public talk hosted by FPMT in Bangalore, India, January 30, 2011, is available freely. Discovering Buddhism‘s modules 1 and 2 are coming very soon in Spanish! We now have our first Spanish Basic Program graduates! In January, Geshe Jamphel handed out certificates to six happy BP grads at Nagarjuna C.E.T. Barcelona. Amitabha Buddhist Centre had a graduation ceremony as well, with some 25 graduates receiving their BP certificates in the presence of Lama Zopa Rinpoche. Many thanks to Geshe Jamphel and Ven. Marga, and Geshe Chonyi and teaching assistant Ven. Gyurme for their sustained and successful efforts in offering Basic Program. Six students from Nagarjuna C.E.T. Barcelona graduated from Basic Program, January 2011. Amitabha Buddhist Centre’s students received their Basic Program certificates in the presence of Lama Zopa Rinpoche, February 2011. Many centers have sent in their Discovering Buddhism retreat and course schedules for the DB Retreats page. Please send yours! Are your DB binders lacking luster? You can now download the inserts for your “Center,” “Student,” “Teacher,” and “Wish Fulfilling Golden Sun” binders! Vajra Yogini Self-Initiation Tunes in Tibetan and English, chanted by Ven. Lobsang Tsering and Ven. Nyingje. Recordings of all of the important prayers of the Vajra Yogini self-initiation practice are available as MP3 downloads. Advice Regarding Spiritual Teachers, a short and exceedingly helpful document prepared by Ven. René Feusi, is available as a free download. Charity to Ants is now available. “Relying on this short practice we can repay the kindness of our mother sentient beings, the ants,” says Lama Zopa Rinpoche. Based on the text by Ngulchu Dharamabhadra and compiled by Rinpoche. Preparations are fully underway for the first FPMT International Translation Conference to be held at Istituto Lama Tzong Khapa from May 13 to May 20. The conference is now full with 40 participants, including Yangsi Rinpoche. Watch this space for a conference news report in June. This is the 20th year that FPMT has been offering food to the monks at Sera Je Monastery. To date, the Sera Je Food Fund has provided over 15,000,000 meals. That’s 2,500,000 meals per year; 7,800 meals every day to help the monks stay healthy and able to focus on their studies, which in turn enables them to become fully qualified teachers to help the world. During the 15 days of miracles (the first 15 days of Losar), when merit created is multiplied by 100 million times, we will be sending out a request for support for the Sera Je Food Fund. 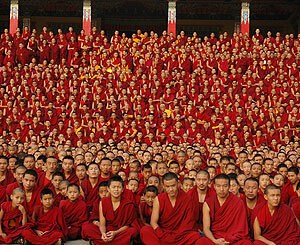 Please help us continue to offer more than two and a half million meals to the 2,600 monks at Sera Je Monastery. Any amount of offering is welcome and extensive dedications are made by the Sangha of Sera Je Monastery. As long as the monastery exists, you will receive the merit of making offerings to the Sangha. Mandala‘s April-June 2011 issue includes a cover story reviewing the accomplishments of FPMT centers, projects and services during 2010 called, “A Year Remembered: Rejoicing in FPMT’s 2010;” a feature story on the incredible life and death of Geshe Tsulga; a recipe from Lama Zopa Rinpoche that turns potatoes from the ordinary to the extraordinary; plus many offerings from the new standard sections which aim to keep the scope of the magazine global while speaking to the common, everyday occurrences of walking the path in daily life. 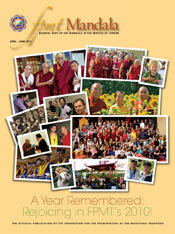 This issue’s exclusive online content is now available on fpmt.org/mandala. Many, many thanks to all participants and coordinators who have submitted their International Merit Box Project donations for 2010. We are still accepting donations through March 31. You may make a credit card donation though the Virtual Merit Box or see our collection information page for more options. We have received 15 exciting applications from 10 centers requesting grants from the International Merit Box Project for their various beneficial projects. Applications will be reviewed and grants awarded in the next few months. Watch this newsletter for updates! Lama Zopa Rinpoche with Dromo Geshe Rinpoche in Bangalore, India, 2011.
copies together with the FPMT Annual Review 2010 in late March! We hope you have found the concise eight-page document entitled Advice Regarding Spiritual Teachers in the FPMT Members Area (under “Geshes and Teachers”). It is already available as a free download from the Foundation Store (under “Free and Seconds”). Please display this very informative booklet publically for all to see and feel free to download and make copies of the booklet for students coming to your center. By answering so many of the frequently asked and essential questions on how to properly relate to a spiritual teacher, it is our hope that students coming to your center will be well informed and protected from mistakes. The wonderful Spanish Translation Service has translated the FPMT Volunteer Thank You Certificate into Spanish. This is available with other helpful Volunteer Support guidelines in the FPMT Affiliates Area. The majority of geshes resident in and teaching regularly in FPMT centers are from Sera Je Monastery. Please support the Sera Je Food Fund which is such an important support for our current and future precious geshes. The Sera Je Food Fund provides the 2,600 monks in residence at Sera Je Monastery three nutritious vegetarian meals every day. Founding members of Shantideva Study Group, Israel. 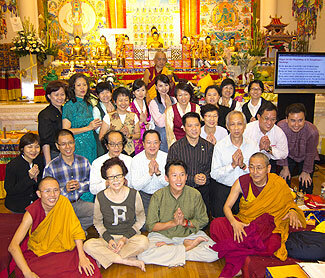 This brings the total number of FPMT centers, projects and services to 159 in 39 countries! With thanks for the efforts of the various coordinators over the years, we announce that Chengawa Study Group, Australia, is closed. Vajrapani Institute, USA is looking for a Resident Sangha Member; Essential Education, UK is looking for a Resources Manager.